Joseph Corthorn was born in Islington, London in 18781, the son of William & Ellen Corthorn, and had moved to live in Lenton, Notts by 18912. Joseph, then aged 14, was working as a printer but later joined the Army and served in the Boer War. After his return, he married Alice Wardle at Lenton Church in January 1904. The couple had four sons - George William, Joseph and Thomas Edward - and a daughter, Edith Elizabeth, the youngest, born in February 1913. By 1910, the family had moved to Beeston, where Joseph found work as an iron fettler, probably at Beeston Foundry, and was living at 13 Lower Regent Street in 19113. By the time that Joseph, as a special reservist, re-enlisted with the Sherwood Foresters on 2nd November 1914, the family - now including all of their four children - was living at Padge Cottage, Padge Lane, Beeston4. As an experienced soldier, Joseph gained rapid promotion, almost immediately to Corporal, to Sergeant in December 1914 and, on being posted to Egypt, on 11 April 1915, with the 14th (Service) Battalion, to Acting Quartermaster Sergeant, as part of the Mediterranean Expeditionary Force, then in support of the Gallipoli campaign. In September, he was admitted to a military hospital in Alexandria where he died of dysentary on 6th September 1915. He is buried in the military cemetery at Chatby, Alexandra. Now a widow with four children to support, Alice moved to live at 3 Chanery Place in Nottingham's Broad Marsh, the community in the low-lying area below St Marys Church that had become, well before that time, notorious for its poor housing and health issues. There was major redevelopment of the area in the 1920s. Alice received an Army pension of 23s 6d (about £1.17) a week to support herself and four children5. Alexandria (Chatby) Military & War Memorial - Chatby is a district on the eastern side of the city of Alexandria. The Chatby Memorial is situated within the Chatby Memorial Cemetery and stands at the eastern end of the Cemetery. 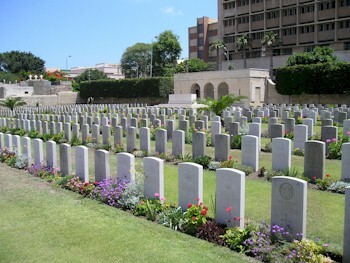 In March 1915 the base of the Mediterranean Force was transferred to Alexandria from Mudros and the city became a camp and hospital centre for Commonwealth and French troops. Among the medical units established there were the 17th, 19th, 21st, 78th, and 87th General Hospitals and No 5 Indian Hospital. After the Gallipoli campaign of 1915, Alexandria remained an important hospital centre during later operations in Egypt and Palestine and the port was much used by hospital ships and troop transports bringing reinforcements carrying the sick and wounded out of the War Theatres6. 31911 Census - Beeston - Piece 1223 RD429 SD3 ED7 Schedule 171. There youngest son, Edward, had been born in Beeston about 9 months earlier. 4Details of enlistment and service are from his Army Service Record.